This is a guest post by Abbie Grotke, Web Archiving Team Lead. We recently moved to a new house, and my husband, a professional musician, has been working on setting up a music and recording studio upstairs now that we have the room. Alongside the clarinets, saxophones and keyboard sit a desktop computer (with better recording setup), laptop (with better movie editing software) and various digital recording gadgets. Then the more helpful “working in digital preservation” wife set about to troubleshoot what had happened when I got home (alas, the files could not be retrieved). More importantly I showed him how to make backups of his files-in-progress to avoid having this happen again. Not all was bad – the resulting movie turned out better in the long run than the original, and he definitely learned a lot about how to use the software and save and backup his files moving forward. 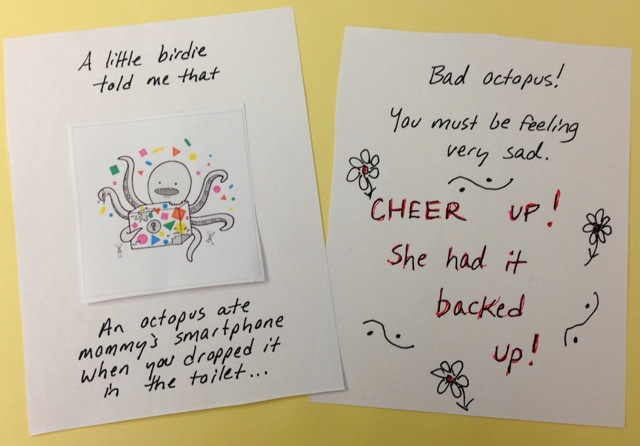 But I kept thinking about those cards… in this day and age of consumers producing and storing so much of their own digital content, and the chance of loss pretty high, wouldn’t it be great to be able to send a note to your distressed Grandma, your upset Aunt or overwrought college student? 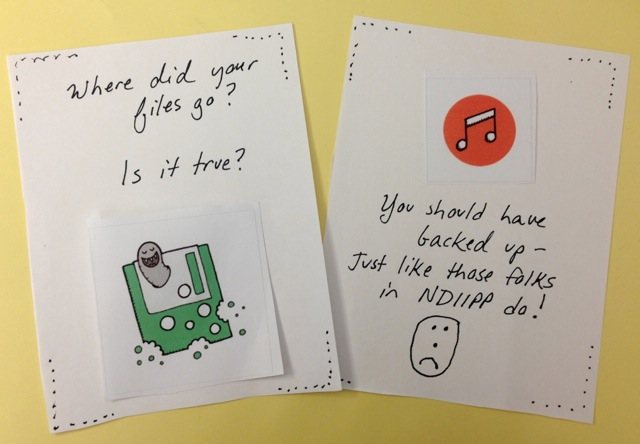 And spread a little message about digital preservation along the way? It is unlikely that the major greeting card companies will set about producing such cards, so I thought I would take it upon myself to create a few mockups for some Friday fun, using some of the great images from the SPRUCE project’s Digital Preservation Illustrations, which were created for the Digital Preservation Business Case Toolkit. All those years in art school clearly paid off. This is a syndicated post. 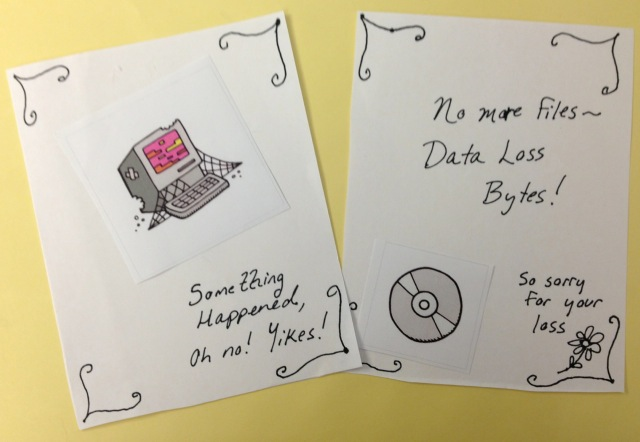 Read the original at The Signal: Digital Preservation 2013-09-13. ← Welcome, NDSR Inaugural Class!